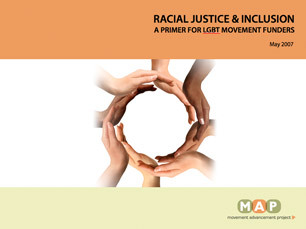 MAP's Primer: Issues of Racial Justice and Inclusion serves as a starting point, rather than a definitive analysis, that can inform efforts to work on racial justice and inclusion within the lesbian, gay, bisexual and transgender (LGBT) movement. Drawing from secondary research and a small number of interviews, it is designed to provide an overview of general issues of race and ethnicity in American society and to motivate LGBT funders to work on issues of racial justice and inclusion. By 2050, more than half of Americans will be people of color – and today, nearly every indicator of well-being shows disturbing disparities according to race. Yet the LGBT movement’s lack of substantive work on issues most relevant to people of color leaves the movement vulnerable to irrelevance and division—and leaves fully one-third of the members of the LGBT community underserved. This primer aims to inform and motivate LGBT-movement funders to work explicitly on issues of racial justice and inclusion. The primer illuminates general issues of race and ethnicity in American society, discusses why funders aiming for LGBT equality should work explicitly on matters of race, offers recommended philanthropic approaches to racial justice and inclusion (including language recommendations from the Aspen Institute and a model organizational self-assessment from the Annie E. Casey Foundation’s Race Matters Toolkit), and provides recommendations specific to LGBT movement work on racial equity and inclusion. Also included in the primer’s appendix is information on nearly 50 nonprofit and philanthropic organizations working on race, which can serve as a starting point for learning more about existing resources related to this work. Note that this report does not reflect original research into LGBT-specific racial matters. Sources were limited to secondary research and a small number of interviews.